What comes first, the trees or the birds? Poems are made by fools like you and me, but only God can make trees. Visiting Bushmanland (comprising amongst other areas in the north-east of Namibia the Nyae Nyae Conservancy and Khaudum National Park) always leaves me in two minds as to whether, as the saying goes, “The child is being kissed for the nurse’s sake.” In this case, is it about the birds or the trees? 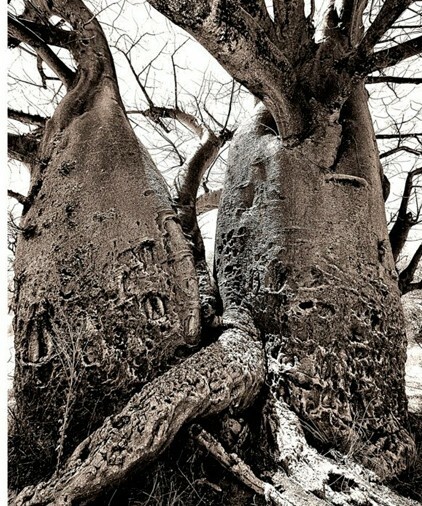 To be more specific, those majestic baobab trees? Somehow you can’t write about Bushmanland without mentioning those impressive baobabs, and they support a large variety of bird life to boot, as one would expect from any self-respecting tree, so let’s embrace them both. 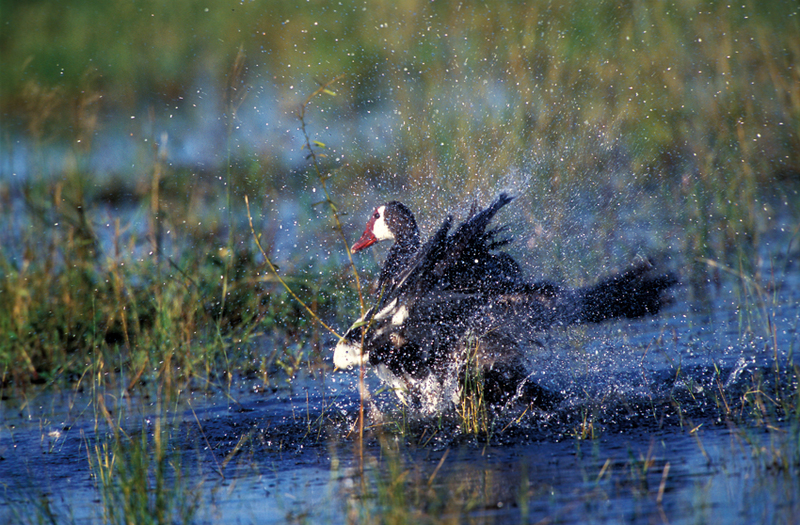 Prime birding time is after a good rainy season. Unfortunately this coincides with terrible road conditions, and you will be subjected to a degree of pushing and shoving and playing in the mud between your bird-watching sessions. After good downpours, the area turns into a haven for water birds, with plenty of other birds joining in the fun and games. Sleeping in Bushmanland under a baobab invariably means hearing the Pearlspotted Owlet and Barn Owls at night, as well as a funny tingling sound. We had several family discussions as to what this could be. My guess was that it could be a new bird, something like a Tingling Cisticola, while Helga was convinced it was a tree. Karlien thought the full moon was the cause, which supported both our ideas, as both a bird and a tree can be moonstruck. It turned out to be cattle with bells around their necks. So much for our powers of perception and deduction. Our first encounter with a Barn Owl was in Bushmanland. It was, to say the least, hair-raising (that is for those of us still fortunate enough to have hair). One night, while sleeping on top of our vehicle under a baobab, we were rudely awakened by an unearthly screeching sound. Not knowing what it was or where it came from was rather scary, but luckily it wasn’t full moon, so it probably wasn’t the lament of a ghost coming to haunt us. The pan next to Holboom is quite accessible, even during the rainy season. When it fills up, it changes into a prime birding area, literally teaming with water birds. The last time we went there, we saw some Whiskered Terns flying over with endless patience looking for food for their chicks, unfortunately out of reach for any meaningful photography. Little did they know that the ‘blue thing’ on top of our vehicle was, in fact, Peter’s boat, our passport to closer encounters with the terns over the next few days. 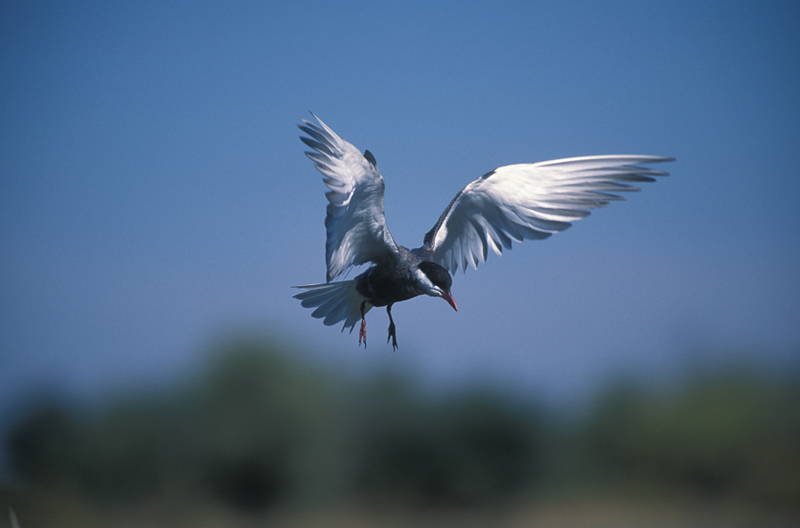 I must confess that doing photography from a canoe with a 600 millimetre lens is easier said than done, and I suspect that some of the funny sounds the terns uttered when flying overhead were not expressing anger, but rather amusement at the commotion going on in the ‘blue thing’. Trying to keep the boat stable, upright and moving in a specific direction while attempting to take pictures of the activities overhead is no joke. Apart from the terns that kept us busy most of the time, we also saw White-backed Ducks, Red-billed Teals, Comb Ducks, Fulvous Ducks and Southern Pochards. The Grey Heron wading in the shallow water ignored us completely, but I suspect he saw from the word go that there was no way these morons from Windhoek would ever pose any danger to him, especially watching the ‘blue thing’ rocking precariously from side to side. Siesta time should be respected by everybody in Namibia, especially if you have a big baobab tree under which you can take a nap. Unfortunately, instead of sleeping, we invariably ended up bird watching, because who can sleep when bird parties fly through your camping area, one after the other? To be quite honest, I never dreamt of seeing a bird party with Crimson-breasted Shrikes, Acacia Pied Barbets, Red-billed Buffalo-Weavers, Fork-tailed Drongos and a pair of Common Scimitarbills all in the same group. 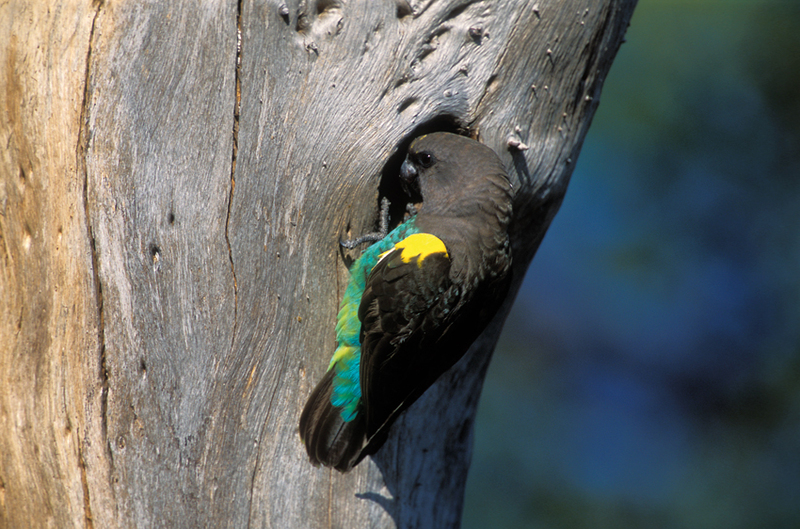 The marula trees not only supplied us with some very delicious marulas, but also attracted fruitarian birds such as a Meyer’s Parrot nesting in the trunk of a dead tree. 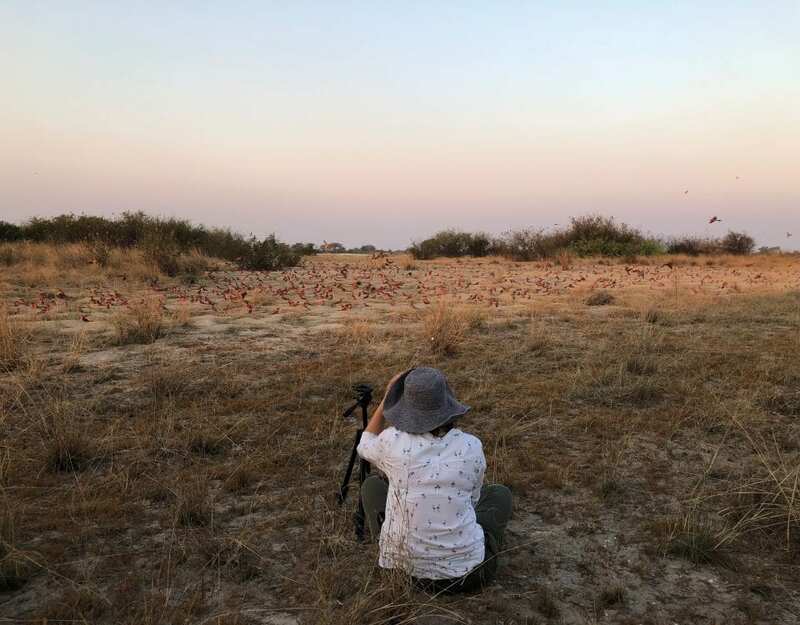 Other welcome visitors were Burchell’s Starlings, Eurasian Golden Oriole, Southern Yellow-billed Hornbill and Bearded and Golden-tailed Woodpeckers. Come to think of it, I wonder if these woodpeckers are ever paid for those nice little nests they hammer out in the tree trunks, because it seems they supply quite a large number of birds with nesting space. A visit to the Nyae Nyae Pans is a must when going to Bushmanland if you can get there without becoming stuck in the mud. To find a group of 30-odd Wattled Cranes wading in the pan is, to say the least, a dream come true for any true-blue birder. We tried to get closer by trampling through the shallow water, but they are obviously not stupid. I must admit, this was before the ‘blue thing’ became part of our modus operandi. The bird life in and around these pans is impressive. We saw some Greater and Lesser Flamingoes, African Openbills and a large flock of Spur-winged Geese. There were also the usual waders, more about them later. Raptors are relatively abundant in the area, especially in summer when large numbers of migrants join in the fun. Tawny and Martial Eagles, Black-chested Snake-Eagles and African Harrier-Hawks are some of the more common raptors, while Black-shouldered Kites and Southern Pale Chanting and Gabar Goshawks are the more common smaller raptors. Be on the lookout for Pallid and African Marsh-Harriers patrolling the pans. Further to the east lie the Aha Mountains, probably not named for their impressive size, but more likely by a Dorsland trekker relieving himself under a baobab. If you’ve done the Holboom, Grootboom, Leboom and all the pans, you’ll understand my dilemma of wondering what comes first, the trees or the birds. 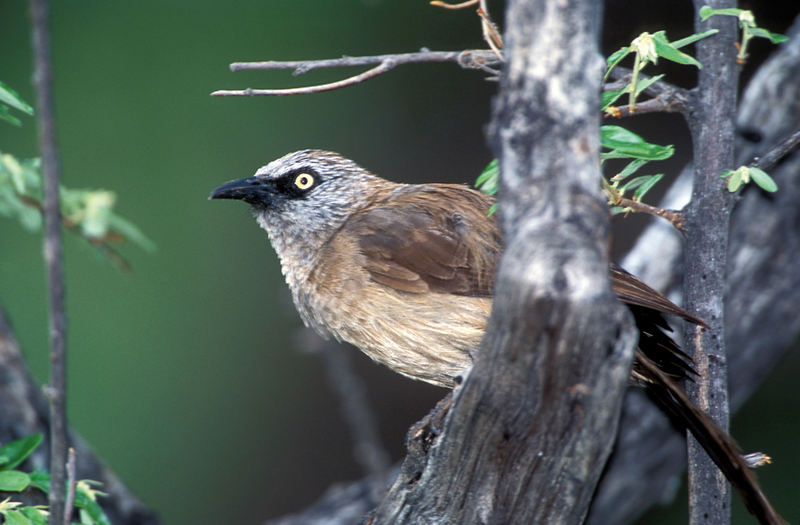 If I could have my way, I’d add birds to the trees alluded to by PJ Schoeman.